We owe a big thanks to barley. Indeed, our very evolution evolved, was sustained and nourished by barley crops. The world’s oldest grain, barley remnants have been culled from the “plates” of ancient man. Though the major use of barley today is in the production of alcoholic beverages, mineral and fiber-rich barley is considered one of the world’s healthiest foods. If not for my family’s intervention, I would have named my son “Barley”, in homage to this superior grain. 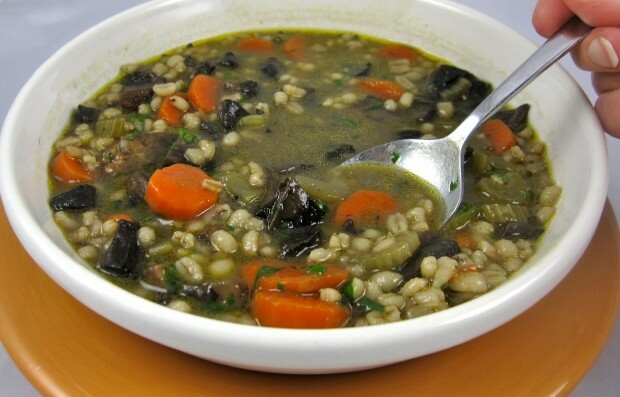 The nutty flavor and chewy texture of barley is a heavenly match with the rich, meaty flavor of portobellos in this soup. Portobellos have a longer growing cycle than whites and criminis, resulting in an unctuous, earthy flavor. I much prefer using them to button or cremini mushrooms for long-simmering soups, such as Mushroom-Barley. I love marinating and grilling portobello mushroom caps. With winter knocking on the door, I will begin simmering them in soups and stuffing them with potatoes or vegetables; I will need their sustenance to get me through another winter! Note that I am not using quick-cook barley in this recipe. If that is what you have on hand, put the barley into the soup during the last 10 or 15 minutes of simmer time. I love this soup in particular with lots of freshly ground pepper. The sherry is optional but I think it adds a marvelous layer of flavor. Or try a splash of micro-brewed beer instead, another beloved beverage that owes it’s very existence to barley. In a large, heavy-bottomed pot, heat oil over medium heat. Add the onion, carrot, celery and a pinch of kosher salt. Sauté for 5 minutes. Remove portobello stems and, with a damp cloth, wipe tops clean and dice (you should have 4 cups). Add garlic and diced mushrooms to the pan and cook for an additional 3 minutes, stirring occasionally. Sprinkle mixture with flour and cook for 3 minutes, stirring. Stir in the stock and barley and bring to a boil. Reduce heat and simmer for 35 minutes. Add sherry, if desired, and simmer an additional 5-10 minutes until barley is tender. Season with freshly ground pepper and kosher salt, if needed. Stir in minced parsley and serve.